The sun had been up for a few hours, but the thick layer of cloud was doing its best to hide it as I set out at 7.45am. It was already quite breezy, but thankfully nothing compared to the previous evening so I set about trying to get some miles under my belt. The route is quite hilly, but by pushing myself quite hard I was able to do 33 miles in the first 3hrs before stopping for a cup of tea. I had stopped at the same cafe as Andrew and Jamie who had been staying in the same guest house in John O’Groats. I felt good about having caught them up, especially as they were travelling with a support vehicle and only had the weight of themselves to haul up the hills. As well as a support vehicle, they had a swanky GPS which informed them that the route to that point had involved 1800 feet of ascent, but more importantly gave warning of two major hills in the next 15 miles that would comfortably double that. Hadn’t someone told me this road was quite flat? When they came the hills were like a miniature Swiss Alps, taking my speed right down to 3mph and turning my legs to jelly. Eventually they gave way to an awesome downhill, and beautiful sunny weather on the other side of the mountains. It was 12.30 and I was approaching the 50 mile point, so took another short break at Helmsdale where I made the most of the weather. 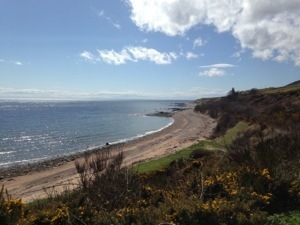 I resolved to keep going for another 20 miles before taking a break for lunch at Golspie. By now my legs were really feeling it, and on every hill it felt like I was going slower and slower. The worst thing was the headwind. On some flat sections I was struggling to achieve 5mph on the flat. It felt like cycling through glue. It took me over 3 hours to reach Golspie where the weather eventually turned, making my picnic of cold pies and chocolate bars a bit of an anticlimax. I set off on the final 50 miles feeling less than enthused. In fact I was having serious doubts about whether I could do it within the 4.5 hrs of remaining daylight. I made better progress from here, but I was so so tired and there always seemed to be another hill just around the corner. They made me feel like crying. I couldn’t risk stopping for fear of getting stuck on the A9 in the dark, so I just had to keep pushing on through the pain. The last 3 hours were cold and drizzly, and it wasn’t until 9.15pm that I crossed the bridge into Inverness and went looking for my B&B and a hot shower. I can’t even remember my head hitting the pillow.